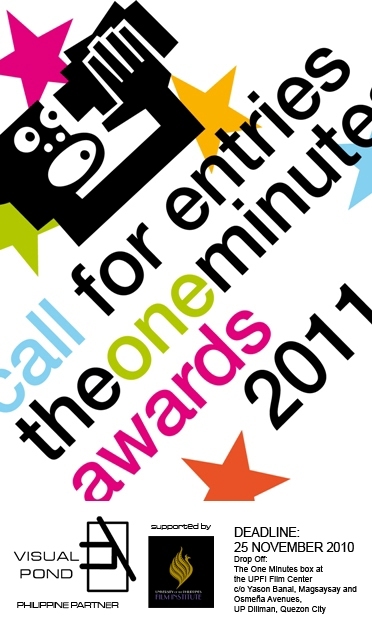 VISUAL POND, as the Philippine partner of The One Minutes Foundation and with the support of the UPFI Film Center, invites artists and video/filmmakers based in the Philippines to submit entries for The One Minutes Awards 2011. The One Minutes (TOM) is a brand name for moving images that last exactly one minute with its core activity being the annual competition, The One Minutes Awards. Launched in 1998, it has developed into a global network with makers from 100 countries and an archive of 10000 video works that are shown (inter) nationally on many podia. It is organized by The One Minutes Foundation, a non profit organization hosted by the Sandberg Institute in Amsterdam, Netherlands. - Entry must be exactly one minute in length. - Entry must be of broadcast quality. - Please use 16:9 HD format. Export your movie as Quicktime or .avi at 720x576 pixels with dv-pal compressor, anamorphic, 25 frames per second and 48kHz sound. Per category 6 videos will be nominated for the Tommy awards plus cash prize. From each category a larger selection of 24 videos will be used as a series for the new One Minutes magazine to which a selective group of podia can subscribe. The annual awards night in February 2011 will also mark the launch of this new video art magazine. For questions relating to The One Minutes Awards, contact The One Minutes directly at info@theoneminutes.org.